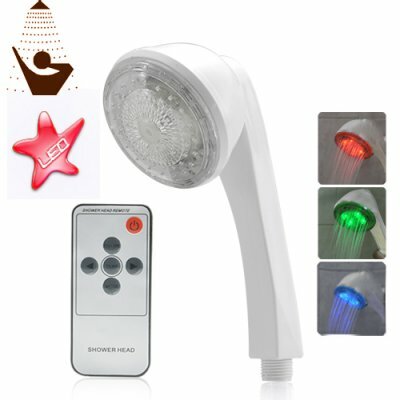 Successfully Added LED Color Changing Shower Head with Remote (White) to your Shopping Cart. LED color changing shower head with HOT, WARM, COLD water detection colors. This lighted shower head changes color with the temperature of the water, ensuring you know by sight exactly what to expect before you jump in. It even flashes red if the water is too hot (above 46 deg C) so you do not burn yourself! Great for new installations or retrofitting into existing showers, this LED Color Changing Shower Head with Remote includes all the necessary mounting hardware so you can have it installed and working in just a few short minutes. Ever since we introduced the first version in 2008, these have become an instant mega-hit with customers. Now, we are happy to give you a new deluxe version of the super popular LED Color Changing Shower Head, this one with a remote for added fun! Who needs a LED Color Changing Shower Head with Remote? Everyone! Why shower under one color when you can have a constant color show? Have the lights randomly fade from one color to another or even quickly jumpshow between colors. Of course, you can always just leave it in its standard operating mode as an RGB temperature detecting shower head, the choice is yours!! Bathroom retrofitting projects are expected to be quite popular in the next few years as people look to save money by staying home instead of going on expensive trips. By featuring this lighted showerhead in your store, you can both dazzle your customers and cash in on the upcoming boom of stay at home improvement projects. This really is one product both gadget freaks and gadget novices will want to try-out and then fall in love with! Note: This great new product is available factory direct low china wholesale price and we'll even dropship it to your customer. So get your sample orders in now to experience this great product for yourself! As always, it is in stock in our warehouse and is available for immediate shipment. Click "add to cart" to order yours today. What color LED's does this product contain? If I use this shower head, does that mean I do not need to turn on my bathroom light? Usually the light provided by the LED shower head is enough to take care of all of your "business" in the shower. How are the LED's powered? The water current flowing through the shower head powers the LED's. That is why when you install this shower head you will notice a decrease in the water pressure versus your previous non-LED shower head.